Dungeon of Signs: Encounters Among the Moribund Hulks of the Great Rust Waste. Encounters Among the Moribund Hulks of the Great Rust Waste. Running East to West, the exact size of this belt of ancient trash and abandoned technology is unknown, as the winds that whip the sands of the desert into flesh stripping cyclones uncover and conceal new deposits every season. The sand scours the ancient objects clean, so that each new pile of twisted junk gleams like treasure for weeks after it is uncovered, before the dust and flash flood rains cake it in dry yellow grime and flakes of ruddy corrosion. 1. A broken tower of rusted bits and corroded pieces. The tower is later construction, obvious order amongst drifts of similar rusted detritus. All three stories are uninhabited, though close examination will reveal signs of a massacre. Black stains on the wall that are not corrosion, a spray of cracked teeth covered in dust, though nothing else to indicate who may have dwelt in the tower or what exactly befell them. There’s a light ballista wrought from scrap bolted to the tower’s roof parapet. While it’s lacking ammunition and has cranks in need of oiling, the compact siege weapon is well made and still functional (3D6, two rounds to load, requires crew of two – 250lbs, spall shield offers base AC 6 to crew). Divination spells will reveal that the residents of the tower (idealistic freeholders or simple bandits, were slaughtered in the night by lanky unknown creatures that came from the rust piles in the night and left no one alive). 2. A circle of ancient sprockets, gears, crank arms, springs and rockers arranged in the dust. They make a flat maze of sorts, leading to an empty central circle. If the maze is walked from beginning to end, which will take two turns, the maze walker will see a large rusted knife plunged into the earth at the maze’s center (though it remains invisible and insubstantial to anyone else). If the knife is removed there will be a cacophonous noise and rays of black energy will erupt from the earth where the knife was. In a couple of rounds these rays will open into a portal to somewhere else in the earth. Beyond the portal is a steppe of black grass and dull titanium skies, cut by the contrails of predatory cybernetic drones. The dagger removed from the earth functions as a short sword +1, though it will shatter into a web of razor sharp fragments (doing 3D6 to all in a 30’ radius, including the wielder. Save vs. dragon breath for ½ damage) if it ever strikes an elemental. 3. Boiling from a nest inside a huge ceramic bell, half buried in the dust, a pack of (2D4) past spiders seeks to feed on the explorer's contemporaneousness. Each creature is a spherical ball of compacted objects once valuable, but now confusing dross. This central sphere is surrounded by six to thirty sharp legs made of rusted wire and fragments of corroded metal. The creatures lair in the bell contains the corpse of a prospector wearing ruined leather armor and carrying old but thoroughly average supplies. He does have a ruby amulet beneath his long white beard worth 400 GP and in a the bottom of his boot is a map to a narcotic mineral deposit (worth 1D4x10,000 GP, but requiring hydraulic mining to take full advantage of) 80 miles away. Past Spider - AC 4, HD 2, ATK 1(engulf), DAM 2D4*, MV 50', SV F2, ML 10 *Attack ages 2D10 years as well as injuring as the spider feasts on the victim's future and present. 4. Jutting like a tower from the scrap piles is the shining cigar of an ancient flying ship. It may be accessed by a precarious climb through jagged metal teeming with infections, and once viewed closely appears to have been scrubbed free of insignia by the winds and sand. The darkened interior is readily accessible and contains (1D6) 1- Rotted munitions (10D6 fireball if disturbed or exposed to fire) 2- An angry undead crew (2D6 wights or zombies) 3- government documents from the regime of a fleeing despot concealing a small locked case of gold bars (3,000 GP in gold) 4- tens of thousands of brightly colored plastic animal toys (they squeak!) 5 - the tomb of a junk savage chieftain (possibly with rude treasures and guardian junk totems) 6 - the private flyer of a rich magnet, now decayed into old bones and soured velvet. The unbroken bits of the china set and tarnish silver bar set will fetch 1D8+1 x 100 GP. 5. A region of narrow paths between rusted hulks of colossal machinery. Winding among the towering wrecks is dangerous, though some salvageable metal is easy enough to come by, as machine geists inhabit some of the piles. Grown cruel and sulking in their obsolescence these spirits cannot attack themselves, but can animate the towering ruins causing a pair of them to smash and grind together destroying any trapped between (8D6 damage, Save vs. Wands to leap partially free for 2D6 damage). The impending crush of a pair of machines can be detected by a cautious individual attuned to danger (a scouting thief/specialist may roll detect traps/search to sense which piles are dangerous and avoid them), divination or an arcanist with an eye for disruptive forces (detect magic). Attacking the clashing machines does little as the Giests will flit away cackling with the sound of gears locking, shattering vacuum tubes and grinding metal. Only a proper exorcism make the area permanently safe to travel. 6. Ancient metal drums bob on the surface of what appears to be a chain of small lakes. These are tar pits created by enormous dumps of ancient petrochemicals and synthetic oils. While easy to wind between these pools are dangerous to any that enter them. Stepping into a pool requires a STR check to escape the sucking sludge. Failure means that the victim is held fast and will slowly (1D4 turns) sink in to their death, suffocating amongst the tar and the preserved bones of the creatures that have been trapped before. Friends may aid a trapped individual, using ropes or poles to grant a new Strength check. Others wading in to rescue a trapped victim much make two STR checks, one to free themselves, and another at a two point penalty to free the first victim. 7. Menhirs of solid black iron flecked with rust have been driven into an arcane circle here, around a central altar block. The black iron block is stained with a greater amount of rust then the henge around it, marked and scored with the cuts of sacrificial daggers. If a sentient being is sacrificed here with a iron blade the god of the place, a forgotten deity of tears and oxidation, the avatar of another distant god, will appear in a clanking panoply. It is a hungry god and for the sacrifice can grant knowledge of what will cause a petitioner the greatest sorrow, or the location of weapons long abandoned. It is a stupid and petty god, so these answers are not always correct or comprehensible - even if they are always true. The Rust God will be sated after a sacrifice and cannot be called again for 19 months. Lingering in this palce more than a turn without offering a sacrifice is dangerous as it will attract the attentions of several (2D4) Rust Weirds which seek to feast on the the iron rich blood of sacrifices. These snake like elemental vermin, seemingly made of chains plated with oxidized iron ingots lash and bore into prey to bathe in corrosive iron rich blood. Rust Wierd - AC 5*, HD 3, ATK 1 (gnaw)**, DMG 1D6, MV float 30', SV CL 3, ML 8 *Immune to normal weapons ** Attacks damage ferrous armor for 2 points of AC per attack. 8. 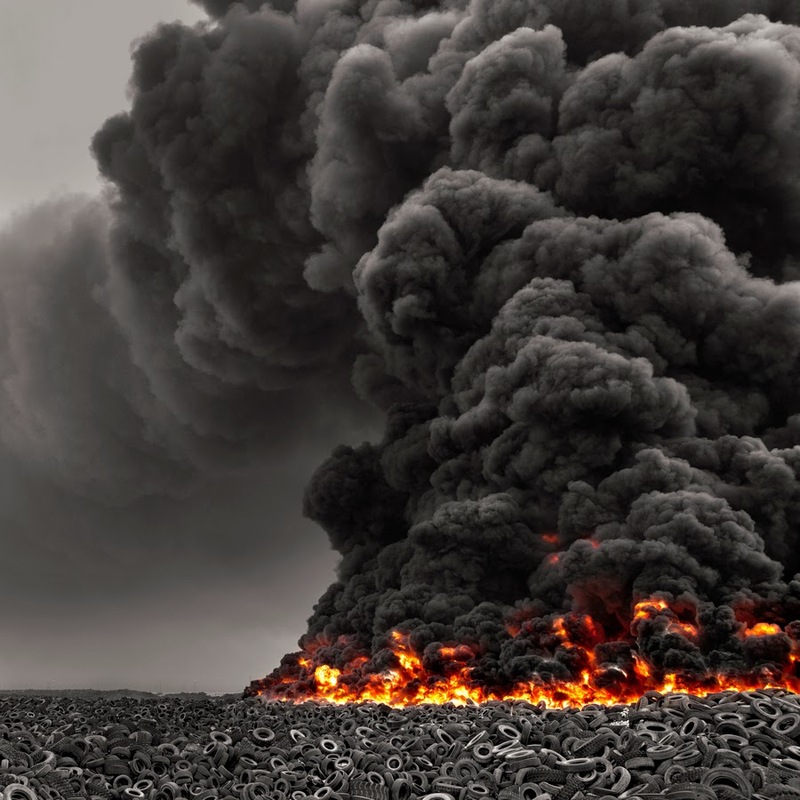 A low range of hills made completely of rotted black rubber cylinders. Nothing lives in this horrible stretch except clouds of stinging midges that breed in the water trapped by the ancient waste. The expanse of heat absorbing blackness creates a hellish environment and anyone lingering must Save vs. Poison (Once an hour) or collapse from heat stroke while wandering within this labyrinth of unstable trash. If effected by heat stroke a character will die is not rescued by companions, and be reduced to 1HP until they can rest for an hour in the shade and drink clean water. 9. A 30’ tower of precarious boxes and panels made of cracked glass and time rotted resins. These were the ancient’s crying mirrors, and they have little value now, though they are akin to the god’s eyes of the sky temples. Some gold, copper and rarely platinum may be recovered from burning the ancient mirrors, but the smoke is toxic and it requires refined oil to start such a fire. Each mirror burnt will leave nodules of noble metal (1D4-2 GP, 1D6 CP and 1D8-7 PP) that can be picked from the ashes. If the entire tower is burnt, several days of picking through the dust will recover 1,200 GP, 8,000 CP and 200 PP. Of course the toxic plume of the burning will be visible for a hundred miles, and this destruction will anger the 3D6 media phantoms that lair within the pile. Exploring or camping near the tower will also arouse the phantoms interest and 1D6 of them are likely to investigate any visitors. Media Phantom (As Shadow) - Pale figures that appear almost real at night (WIS check at -2 to detect) except for tics and occasional blurs. Each figure is some popular character or personality from ancient media. During the day the blurring, slightly off coloration and occasional vertical hold issues make Media Phantoms obviously unnatural. The phantoms are not often overtly aggressive (unless one burns down their home); preferring to use their ancient appeal to lure individuals away with promises of treasure or comely companionship and then mob them. 10. A 1-4 mile long field of jagged broken glass and rusted fragments. Movement is reduced by ½ and any person not wearing heavy boots or mount must save vs. wands every turn spent crossing the expanse. Failure to save means a nasty cut – 1D4 damage plus (Roll a D6) 1- Hobbled (movement halved for 1D4 days) 2- Infected (wasting disease, lose one Con a day until cured or dead [at CON < 3) 3- Bleeding (roll for random encounters twice instead of once each check) 4- Embedded junk, 1HP more damage to remove 5- Curse Loudly 6- Stoically endure. Superb. This is a setting I'd love to play in. Oh I like this, I'm now obsessed with a way to squeeze this into my Land of a Thousand Towers game tonight. For which I owe you many thanks by the way. Prison of the Hated Pretender went down a treat, then one of mine, and tonight, young Dawn and her alluring ways has the PCs headed towards the Obelisk of Forgotten Memory (poor suckers are still only first level, oh oh!). Anyway, thanks Gus, excellent as always. @Calum - I'd be interested in hearing how your Obelisk and Hated Pretender sessions played out. If you post them anywhere drop me a link! Also is your party afraid of the ASE? I think even Pat's party has gotten afraid of the ASE. Hi Gus. They really enjoyed Hated Pretender. We lost two characters (one with throat torn out by the Pretender - failed save at 0hp, one to stupidity on the pit trap) and nearly lost another (again grabbed by the neck by the Pretender, saved vs death to survive 0hp). I have some notes from the first three game sessions but haven't put them up anywhere. I note your new map with excitement; as the Armillary from the Hated Pretender will probably pop up again (I mistakenly initially described it in inches rather than feet and the PCs were hired to go and get it for their patron One Tooth Mary, (who may be a retired & cursed Black Jenny). Mary has since passed it on to her 'client' who is an as yet undefined wizard follower of the cult of starry wisdom (Mwah ha ha!). Of course one of them activated it, and received the prophecy of doom, but that PC took a laser bolt through the back while wearing a pack full of oil flasks in the next adventure and so is now rather dead; but is the prophecy? My favourite moment was when they were in the basement thinking they had defeated the pretender and the door above was flung open and the Pretender screamed down "Which one of you f#$%^n c#$%s smashed my pumpkins!". In the last session the PCs made it to the Obelisk, and the Thief while scouting had just snuck up on one of the ghouls, who turned to the thief and hissed "what do we have here then?". It was a very scary moment for the thief player and we're all quite excited about next session. I am a little concerned that they're not ready for the adventure as they're still first level, and mostly newb players, but I have instilled in them a good sense that sometimes you need to RUN! As for the ASE, it hasn't come up yet. Probably too much for them right now, and to be honest, I like the Land of a Thousand Towers more than the megadungeon. Calum - Sounds about right - funny thing is Hated Pretender was never a ASE module. I love the gatehouse of ASE for 1st level dudes. Glad the pretender "lived" he has potential I think, if he can ever escape the tower. I am really happy it went well. I take it that the party never really tangled with the lawful torment ghosts. I think 1st level can handle the obelisk if they ally with the cultists or fleas early, and if they are cautious. There's nothing inherently super deadly in the graveyard, but there are a lot of fleas and cultists. The good thing is adventurers can always outrun zombies. They may always loot a little and flea to town, though starting off tackling the Ghoul cottage might be trouble due to those spells, remember I designed the groundskeeper with the idea that counter-spells would be doable. Really depends on PC numbers. Anyhow - excited to hear how it goes.